I absolutely LOVE this race. Although this was my second time running it and I am from Richmond, this is still one of my favorite races. Parking can be a pain, but that is to be expected at a race that is held in a city. The scenery/route is just beautiful and for the most part, flat. The finish is an epic downhill and one you will definitely remember. Always amazing swag, nice technical long sleeve tshirt, a finishers blanket, awesome medal and a cup. I will say the expo was not great, with as many people as this race brings, the expo could be much better. The after party is is a lot of fun! It is held on Browns Island overlooking the James River. Pizza, bagels, beer and music are a few of things you will find. 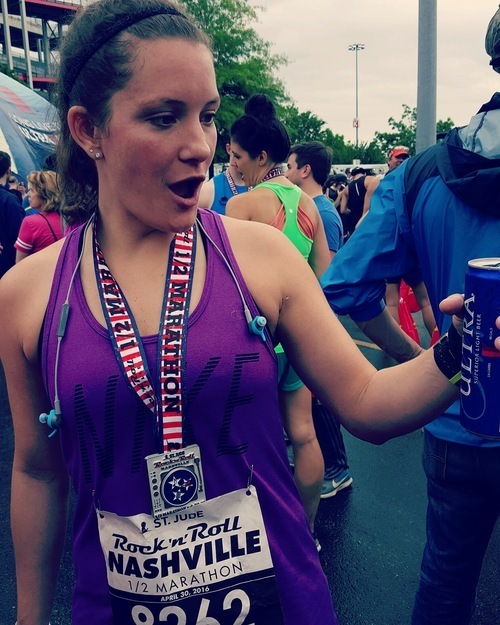 This race does not give participants beer tickets, so you do have to buy your own beer. This year there was yoga, massage tent and vendors set up for the post race party. Overall, an awesome race, would totally recommend! I absolutely loved Rock 'n' Roll Nashville. This was my first race of the RnR series and I was not disappointed. I had read previous reviews of people who had run RnR races that both loved them & hated them. RnR Nashville was very organized, the course was FANTASTIC, the music at every mile was great and the crowds were excellent! I would def suggest paying the extra money for a parking pass for this race, although we ended up not using ours because the hotel we stayed at had a direct shuttle, I heard that it was TOTALLY worth the money! Although it rained the day of the race they were very well prepared and although we had a delayed start time, they kept everything organized for the most part. The only thing that was annoying was the corrals were not big enough. Once the rain passed and I tried to jump back in, I ended up having to start in a corral behind the one I was supposed to be in because there was no space. People were having to push their way in wherever they could. The expo was OK, Brooks stole the show. The swag was ok, shirts were nice quality (brooks), but that was about the only thing you got. The medal was awesome... extremely good quality (heavy!) and it even spun! HA! The best part about the Nashville race was the course, tons of challenging hills and great scenery. The crowds were awesome despite the weather and the finish line was so cool as it was lined with people! The after party was kind of lame, we didn't stay long. You get one beer and only have one choice, which is disappointing. Also the size was smaller than the ones you could purchase for cash. "Who doesn't like to run for chocolate?" 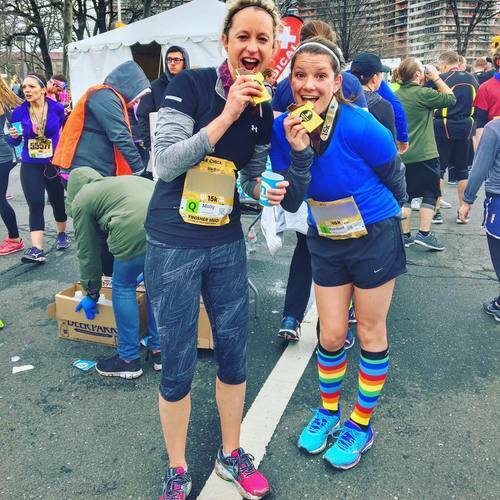 Seriously, who doesn't love to run for chocolate?! This race was awesome. Cold, but awesome. Everything was well organized and the course was beautiful. The swag definitely gets 5 stars for the super awesome hoodie they give instead of a tshirt. Course wasn't too difficult, not many hills. There wasn't much crowd support but the race brings tons of people so you are normally surrounded by other runners, which can be fun! Overall, great race in PA! Ukrop's Monument 10K is by far one of my favorite races! The Richmond crowds NEVER disappoint. Despite the weather being cold, windy, rainy, and snowy in 2016 there were people still lining the streets to cheer the runners on. The race runs along historic Monument Avenue in Richmond, VA. This street is absolutely gorgeous, lined with beautiful old homes, statues and on cobblestone/brick road at parts. There is a center median the whole race where there are bands, people, groups, and tons of support and lots of energy! The weather is always really sketchy it seems, but it never really stops the thousands from running it! For a 10k race, it is HUGE! The expo is pretty decent, especially for being a 10k! You get lots of free swag, which is always a plus. The tshirt is OK, I really wish they would switch to a technical shirt instead of cotton. But most don't wear the race shirt on race day anyway! The race takes place in the city, so of course parking can be an issue. But many decks are open. Other than that, it's street parking and with the streets surrounding the race closed it can be difficult to find a spot. The after party is ok (this is an alcohol free race), small area for lots of people, but loud music, food and fun. This race is a super family friendly race which makes it nice! Overall, the race is very well put together, brings an enormous crowd & is tons of fun!